With winter coming soon for many of us who live in the colder climates, getting stranded in your car can become a dangerous possibility. As a result, everyone’s emergency car kit should contain the ability to heat your car if you were stranded or holed up waiting the passage of a winter storm. Even if running your engine is an option, you may need to conserve fuel for the return trip. Also, carbon monoxide can build up inside a standing vehicle while the engine is running, even if the exhaust pipe is clear. In this article, I will be demonstrating how you can make your own survival heater for your car that is cheap, safe to use, and easy to construct. A small empty metal can: You want this to be slightly taller but thinner than a standard roll of toilet paper. My can of choice is an unused 1 quart aluminum paint can found in most hardware stores. You can also use an empty food can that fits this description. A larger metal can that can easily accommodate the first one: I use a 1 gallon unused paint can (again found in most hardware stores). Another option is a coffee can, metal bucket and so on. Some type of lid that can be placed over the larger can: I also like to get a lid for the smaller can for which I will explain later. Prepare the toilet paper: The first step is to take out the central cardboard tube from the toilet paper roll, leaving only the paper behind. Squeeze the paper into the smaller can: Next you’ll want to squeeze and roll the paper into the smaller can. 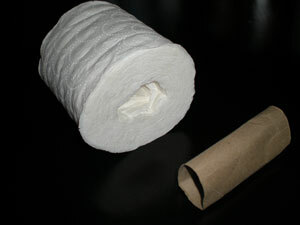 If the can is so small that a full-size paper roll has no chance of fitting inside it, then you can remove some of the external sheets (just like you would if you were going to the bathroom) until it does squeeze into the can. It’s important that it fills up the entire volume of the can. Add the fuel: If you are now ready to use it, simply add the alcohol until the toilet roll inside the can is completely saturated. One of the benefits of using a 1 quart unused paint can is that you can store the stove with the fuel already added by placing the air-tight lid over the can. This saves space and allows you to have more fuel available. 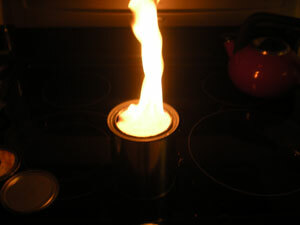 The lid can also be used to control the output of the flame which I will explain below. Place the smaller can into the larger one and position it in your car: The larger can provides an insulating barrier and some protection for passengers and your car. You’ll also want to position it in a place that’s far enough from anything combustible. Use the palm check. Put the back of your hand against the surface you’re worried about and if you can’t keep your hand there without burning it then it’s either to close or you’ll need to adjust the flame. 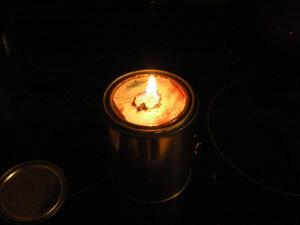 Light the stove: First, open the window just a crack to provide some airflow and then carefully place a match (or throw some sparks using a firesteel) onto the saturated toilet paper and viola! you’ve got yourself a burning stove. Use caution in lighting as it will combust very quickly. It’s best to partially cover the smaller can with a lid to decrease the size of combustion (you can always increase it later (see next section). You may notice if you follow the steps above, that a pretty sizable flame results from having the smaller can’s opening completely exposed. While this is fine if you want to warm up faster, it does tend to go through the fuel fairly quickly and is not so efficient. A better way is to partially cover the smaller can with a lid. 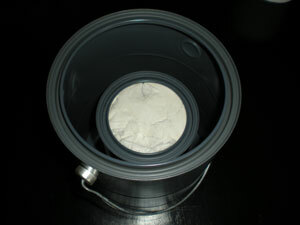 Or if you used a 1 quart paint can, you can make a small hole (about the size of a quarter) in the lid it comes with and place that on top of the can. Both of these methods control the burn rate and allow the stove to provide a constant heat. Another option is instead of completely saturating the toilet roll (as indicated in step 3 above) you can pour just a few ounces of alcohol on the paper and regularly add more as it burns out. This will also control the size of the flame and conserve fuel. I prefer to use the lid method over this one since you don’t have to regularly add alcohol (it’s nice to sleep for a stretch of time and not have to regularly add fuel). Carbon monoxide is produced from the partial oxidation of carbon-containing compounds. “Partial oxidation” is just a big word for what happens when combustion (fire) takes place in an area where there isn’t much oxygen. This is most apparent when one operates a generator inside a home or if their wood stove is improperly vented. In the case of this alcohol stove, while there is risk of carbon monoxide emissions (rubbing alcohol contains carbon: C3H7OH) the risk is very minimal. Opening your window slightly should provide sufficient oxygen for a clean burn. If you still are concerned about it, I would recommend purchasing a battery-operated carbon monoxide alarm and turning it on (putting in the batteries) when running the stove. This will provide you ample warning should there be an issue. I am curious if denatured ethyl alcohol would be usable for this application. The 10% methanol makes me suspicious as to its safety. I see that pure methanol fumes are definitely toxic, but the fact that it burns completely cleanly without that nasty watery residue left by the diluted isopropyl makes it somewhat more attractive as a fuel. With the 70 percent isopropyl, it seems like after refilling it a few times it would become saturated with the watery residue. It’s too bad that they don’t sell pure non toxic alcohol. You are absolutely right in that denatured alcohol burns cleaner but like you I’m not sure I’d trust it in an enclosed space. 90% isopropyl is probably the purest alcohol you’ll find (and the one that I recommend in this application) that is relatively safe to burn in a small space. I wonder how grain alcohol (homemade ethanol) would fare in this type of situation. You can make it very pure. Erich, I thoroughly enjoyed this video! I truly didn’t think that roll of toilet paper would fit in that little can! If I were to store these ingredients in my car, would they all fit in the larger paint can? I’m thinking of putting the toilet paper in the smaller can and then storing that can and a couple of bottles of alcohol in the larger can? Do you think everything would fit? First of all, thanks for the comments. The large can will accommodate the smaller can (with toilet paper already inside and filled up with alcohol) as well as another bottle of alcohol and another roll of toilet paper. However, I would recommend you storing at least a half-dozen more bottles in the car (which is completely safe). They should fit in a small area inside your trunk. Hey there, great video and description of this neat item! I have a question regarding fuel…methyl hydrate burns quite nicely, what are the pros/cons comparing isopropyl to hydrate?? The bummer of isopropyl alcohol is the sooty residue and left-over water (although the 90% isopropyl is not so bad), but again, in this type of situation it may be ideal due to the less toxic nature of the fumes. Hey Erich, thanks for the insight, I may switch from isopropyl and Methyl as the situation dictates..ie…in a ground blind….with good exchange of air….using Methyl, and more inclosed areas…isopropyl. Good to have a choice of fuels it seems. Do you have a preferance to the many tissue rolls available??? I’m thinking the roll closest to a cotton ball the better wick??? What is your thought? I’m definately in the process of gearing up a heater asap. I’m not sure which roll would be best. I’ve only used what’s available at my house (which seems fairly soft but not super soft). I also would stay away from the scented rolls. As far as which is best, you’ll have to experiment with that one. If you notice a substantial time difference or heat output difference according to roll type used, definitely let us know! I’ve heard that the 70% alcohal would burn so that the flame would be visable much better than the 90%. Seems like a good safety factor. Have you found this to be true? I agree that the 90% alcohol flame is less noticeable than the 70%. Despite that, I still prefer the cleaner-burning of the 90% with its accompanying less water that is left over and longer burning times. Erich, i have “disfigured” 2 quart sized paint cans just trying to tap the lid on tightly so that i can store this in the gallon can. The lid just won’t seat into place properly. Any suggestions? I’m confused, what’s blocking it, the toilet paper? i don’t think it is the toilet paper. the lids rest in the circle ring that is in the top of the can, but when i press it down further, it won’t stay. i can lift it back out with my finger nail. i did this with 2 new paint cans from ACE. maybe i should go to a diff store. I’d hate to have you pull out all the paper again after all that work. But if it closes without the paper in it than it’s got to be the paper otherwise it’s the container. In that case, yes, you should get a new one. I got mine at Lowes if you have that available to you. actually i have not tried to close the can with the lid w/o the paper in it yet…but from the looks of it, that won’t work either. i think the can/lid combo is just cheap. Erich, I just got through putting the heater together using the 1 gallon paint can and the 1 quart paint can I purchased from lowes. I choise to put a quarter size whole in the middle of the quart lid. I used 70% alcohol for fuel. I emptied 1 16 oz bottle of fuel in the quart can and place it in the gallon can and ignited it. It burned fine for a couple of minutes then went out. Should I add more alcohol in it? Also if I get the heater working alright I thought I would drill some holes around the top of the gallon can to let air in, and use a piece of wire cage screening to lay on top of the gallon can so I could place a pan on top of it and cook with it. First off, are you sure the toilet paper is completely saturated? If so, then it sounds like the hole in the lid is a bit small for that alchohol type. When I’ve used the small hole I had 90% Isopropyl with no problems. However, when I refilled with 70% it would not stay lit. So instead I just slid the lid slightly off center of the smaller can and the burn would come out the exposed side. This seemed to fix the issue while minimizing the flame size. The wire cage idea sounds great. That stove definitely puts out enough heat to work as a cook stove as well. Good luck! I will try using 90% alcohol. Also maybe the tolet paper I used is to compressed. I used one ply tolet paper. Could it be that maybe there needs to be some minute air space in the roll of paper so the alcohol can cirulate more easierly through the paper. I will try using 2 ply enstead. That’s a good point with one ply. Whatever material you end up using to fill the quart size can needs to be able to produce the capillary action required for a continual burn. It’s possible that the one ply doesn’t provide that. For my stove I used double ply. Either way, I’d like to hear your results. I’ve also been thinking that a cotton t-shirt stuffed in the can would also be effective since cotton cloth is an excellent wick — again due to the capillary action that the material provides. I need to try that out with an old t-shirt to see how it works. I made a heater using a 28 oz tomato can, 1000 1-ply roll of toilet paper, and 91% alcohol. The paper was fitted in very tightly…I actually had to use the heal of my shoe to get it in well. I used almost 3/4 of a 32 oz bottle of alcohol but it took quite a while for it to soak it up as the paper fit so tightly. We lit it and it burned very well for several minutes with a full flame before we put it out. We lit it again and it still burned well for a longer period of time even without adding more alcohol before the second lighting. I’m sure it would have burned as long as we wanted. It never diminished or acted like it was going to go out. We’re pleased. That’s great Karen! Nice to hear you had success with it. You should probably mention somewhere here that this heater is not for regular use, as the rising emissions will blacken anything above it (i.e. the roof of your car, if using this as a car heater). This is great for emergencies if you’re freezing, but I wouldn’t use it if you just get tired driving in the middle of the night and decide to pull over for a quick nap. Obviously you meant this as an emergency-only tool, but I think people may try to use it for more than that if you don’t specify the down-sides. Thanks for the comments and advice. I agree that it should be used only in emergencies. I did mention this is a survival stove and should be part of your emergency car kit so I assumed people would understand that. As for the emissions, in my testing of the stove (see my Testing Out the Survival Stove and Carbon Monoxide Testing Result articles) I did not get any blackening of my roof. My interior roof is a light (almost white) grey cloth and after both those tests (about an hour of running the stove) no blackening occurred. It may be due to clean burn of the 90% isopropyl alchohol. Definitely test it out for yourself and let me know your results. I love hearing other people’s experience with this stove. All in all, it is a very clean-burning stove that is a very effective heater for your car. It does take a bit of practice to ensure that you run this stove safely so I should probably stress the importance of testing it out before the emergency. The first heater I made worked perfectly. On the second one I spilled a little of the alcohol in the large outer can and when I lit the heater, the large can did smoke and the fire kinda spread out to the larger can to burn off the spilled part. SO MAKE SURE the alcohol stays just in the smaller can with the toilet paper and it will work like it’s supposed to with no smoke. Good advice Karen. Thanks for the comments. Do you really need the toilet paper? Couldn’t the inner can just contain the alcohol? I was wondering how much heat this heater would put out because I am looking for ways to heat a 15o foot room to a temperature of about 70 degrees. Will this heater provide the heat required or am I just asking for problems? The best thing to do would be to try it out and see if it works for you. Besides that , there are a number of stoves ( like indoor propane stoves) that would be more economical over the long term. A few years ago my hubby bought us each a Coleman SportCat PerfectTemp Catalytic Heater. They are fantastic! I’m still on th first cylinder. They put out 1,500 BTU’s,Burn for up to 14 hrs. We keep them assembled. Need only a match or lighter to ignite. Worth the money in our books..
I’ll check that one out. This works well with cheap vodka too. Excellent point Billy. Thanks for the comments. ok i have to ask..where do you sit this in your car??? in the seat?? won’t it get to hot?? in the floorboard?? what about the dash?? I recommend including a pot holder or old oven mitt in the kit. I keep my small can separate w/other stuff in it till use. Large paint can holds 24 oz mason jar w/alcohol CLEARLY MARKED. Room for 2 frozen plastic H20 bottles (must be short enough or 2 empty alcohol btls filled and frozen and clearly marked H20. If they melt they are sealed in large can till ready no leaks. 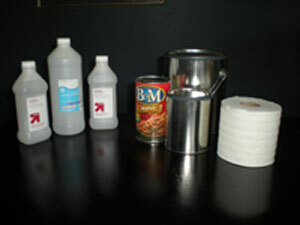 Before starting fire in can, cut and peel water bottles and place ice in can around small can. Melts ice for little dirty water to drink and keeps a safe fire with water in bottom of can. A second large can can old 4 bottles of ice (H20) bottles and serve as a bathroom or snow dipper. After reading all about flames and fumes and storing flammable fuels, I think I’ll stick with what I do now, which is to keep a couple of packages of Thermacare heat wraps in the car. With those plus a sleeping bag, you’re toasty for a couple of days. While this is a great idea, I can think of a few better ways to use toilet paper out in the field if u know wat i mean. A solutition to this is to store the toilet paper without the alcohol and add it all when you need to use it. You are so interesting! I don’t believe I have read anything like that before. So good to discover another person with some original thoughts on this subject. Really.. many thanks for starting this up. This website is one thing that is needed on the web, someone with some originality! I’ve used this type stove on deer hunts, no smoke no odor, be careful since alcohol burns clear and the flame is hard to see. internet explorer, would check this? IE still is the market chief and a good component of people will miss your wonderful writing because of this problem. Nice replies in return of this question with firm arguments and telling everything about that. One way around a dented can or one that won’t seal well… leave the alcohol in its original container until needed. When needed, pour it into the can (tp already inside) and continue with the burn. There are other benefits to this as well… Since the tp is not yet saturated, it is available for use in a non-heat needed roadside ’emergency’ (use the tp as tp was intended). You will also have the alcohol for use as wound cleaning. I have placed the burning can directly on the fabric of my front passenger seat for 30min burn and it did not develop enough heat on the bottom of the can to come close to even scorching the fabric. I can’t say for sure for hours but for 30min, in my experience, it is safe BUT always monitor anytime you have a heat source sitting on flammable material. One possible solution for those worried about burning or melting a seat, for about $15 at Home Depot, you can get a piece of carbon felt(in plumbing section). This is designed to protect from welding and would be more than enough protection against this. Sharlotee – DO NOT place on dash, it is too close to the windshield of the car. If you are using this when it is very cold outside, I would think that could be bad for the glass, sudden extreme temp changes will shatter glass. You could use it that way, but not nearly as safely as with the tp. If the can were to tip or get knocked over with just liquid or gel alcohol you would have an even bigger problem to worry about. If you don’t over saturate the tp, the can, can be tipped and even knocked over (if quickly picked up) and the fuel will not spill, thus leaving the flame in the can. Will 70% ethyl rubbing alcohol work? I was shipped the wrong bottles and plan to make these kits as Christmas gifts, since I live in the mountains. I am most concernced with toxic air space and flame height. It will, but not as effectively as the 90%. The 70% burn doesn’t last as long and it leaves a lot more water as a by-product. So the ethyl versus the isopropyl is okay? Sorry to be so dense. I have had a hard time gauging the toxicity level of ethyl versus isopropyl in an enclosed airspace, like a car. THANKS SO MUCH for your time on this! I just feel very strongly that everyone driving in remoate areas during the winter should have these in their cars survival kit. Ethyl should be fine as long as you ensure you’re getting it (or making it) as pure as you can. You can get the 90% iso at almost any large drug store and it is much safer. I tried something a bit different. Used a quart empty paint can but instead of using toilet paper I used steel wool and packed it in as much as I could. I found with the toilet paper roll that it started to burn once the fuel got down a bit. I use blue fondue fuel instead of rubbing alcohol. I find its a better cleaner fuel than rubbing alcohol. They compare Alcohols, HEET, and Everclear, etc. for use in an Angeria Spirit Burner . You might find it useful for this car stove. They do say that only Everclear is safe to burn indoors, but not sure why? You can get 99% isopropyl alcohol from art supply houses. Artists use it to smooth clay to a very fine finish. No water build up with this stuff. Just thought you might like to know. 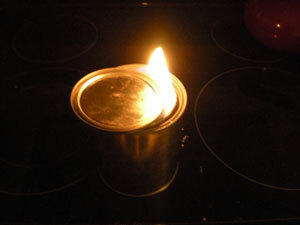 responses here How to Make a Survival Stove (Car Heater). Is it only me or does it give the impression like some of the remarks appear like they are written by brain dead folks? I’ll tell you that I’ve been able to get a 1qt can, an extra 1×16 oz bottle of alcohol, and an extra roll of TP in a 1 gal paint can with a lid on it. I also through some fire cloth, lighter, matches and water tablets in there as well. If you put the alcohol in smaller bottles you may be able to get some more in there as well. point voucher to reimburse your foolish purchase. well as malware. Look for: A teacher near you on the Fendenkrais website:. tang stamp, which is located at the bottom of the primary blade. good and I have learned lot of things from it about blogging. rescue, and today I am just one of the best fighters on iphone 3gs! a similar one and i was just wondering іf you get a lot of spam feedback? сan recommend? I gett so much lstely it’s driving me crazy so any assistance iѕ very much appreciated. understanding anything entirely, however this paragraph offers good understanding yet. videos, this website could definitely be one of the greatest in its niche. Read the article on the can heater. It is a good idea, however, one comment you made really concerned me. You said that you could pour all of the alcohol in or just part of it and add more later. A serious caution here. The flame MUST be extinguished before trying to add more alcohol. I know – common sense – but it is still worth adding the warning. Failure to do so could lead to an explosion in the bottle you are pouring from if the fuel- oxygen mixture hits the right proportions. There was also a question about pure grain alcohol or straight methanol. Both burn with a nearly clear flame. During daylight it is virtually undetectable. Extra caution is highly advised. Serious explosions occur when adding more alcohol thinking the flame is out. I really like the idea of an old t-shirt packed into the can is a great idea and usually if in an emergency,you would probably have something cotton in the vehicle.Just get the alcohol and cans together and put them in the trunk cause Alabama had a catastrophe here in January and folks were stranded everywhere.It would have been great to have been prepared. Nice concept and I like having the 1 quart can fit into the larger 1 gallon can. Two quick questions. 1. Would filling the larger can, around the smaller can with rocks help hold some of that heat to maintain an even temp longer? Also, have tried this method with the smaller quart can in the past: Fill can with wood chips and then saturate with parafrin wax. Lights easy, burns a long time and you don’t have to worry about the alcohol evaporating. Doesn’t smoke much but the CO2 might be a bigger issue. Haven’t used in the confines of a car. Keep up the good info. Whats wrong with a couple of cans of sterno? Anyway, I had a question: Does the toilet paper have to be in a small can that just fits the tp for this to work or can it be in a larger paint can? We purchased some paint cans, but they are bigger than the toilet paper. I was going to put the tp directly into the larger cans that I have and pour alcohol over them, since I don’t have any smaller cans. Would this work? Also do not forget to send the message to social networks. them making billions each year because of the software. lower the risk of Forex trading. Don’t know that is practical for use in a vehicle but some time back I saw an article on heating a small room with clay pots and candles or other small flame sources such as Sterno. If I can find it I will post a link. Some time back I read an article that used a couple of clay flower pots and tea lite candles to make a heater that would warm a small room. Don’t know how practical that would be in a vehicle though. A good, very compressable, sleeping bag (mine compresses into a roll 6 inches in diameter and 12 inches long); a second bag filled with a dozen energy bars, a warm winter stocking hat, a thick pair of wool socks, and a pair of sno-pack boots. Stuff the sleeping bag into one boot, the energy bars, cap, and socks into the other boot, and leave them in the trunk of the car. The sleeping bag will last forever, not just a few hours, and the energy bars, because they become an internal source of body heat (each of which lasts several hours in your digestive track) are better than external sources of heat. The warm winter stocking cap and thick socks reduce your major heat loss. I have been on two week winter camping trips where the temperature never rose over 10 degrees, with little more that the above. By the way great site I’ve just discovered it! Hi! I’m sorry if this question has already been answered but how safe are these fumes to breath and what degree of concern should I have for lack of oxygen? I’m needing something to supplement the heat in our home. Might sound silly but it’s better than nothing and I hear those parrafin wax tea light heaters are bad to breath. With this 90% alcohol do I need to open a window? Wouldn’t that defeat the purpose of adding extra heat? Purchase blank envelopes and cardstock white paper. Be imaginative and come up with your own creations. This is possible by making necessary substitutions. Your plan for a simple stove is a good one. For a ‘bought’ one i bought a time ago a “Kelly” kettle made in Ireland. Its will boil water on twigs (smoky so not good in survival sits) or of course using the toilet roll with the methylated or alcohol etc. The latter i will have to try. For the Kelly Kettle co go to Google and its a short walk. country is NOT in The USA, the government can do nothing about this. An offshore VPN can have two means of understanding. Thanks for sharing your thoughts on slim trash cans. I think you may have something there xnxx. It seems that some of the characters from the Walking Dead may have stumbled across this blog. and I to find it very bothersome to inform the truth on the other hand I’ll definitely come again again. to your writings. Thats also your projects maybe? Yoou can examine if here, I am uncertain if it’s yours tho. “dobrodziejstwo inwentarza” ale przede wszystkim z przyczyny naa skuteczność i dochodowość. Outline distributed unwraps the evident data with respect to medicinal work on advertising furthermore the way it can positively have a bearing on clients. are greater and upgrade to stronger combatants. Very nkce post. I definitely appreciate this website. Super late to the post, in our area we are experiencing a harsh winter this year. Am thinking of giving these out to homeless folks to keep in their encampments since burn barrels are not allowed and emergency heat on days where one cannot reach shelter could be lifesaving, but am afraid of the safety factor. I understand the cans get very hot and the open flame could catch things on fire, but with some caution would you say that this emergency heater would be of use under a tent/tarp, possibly to keep heat for a full night etc. I know this is a bit silly but it just seems like a great economical idea, plus it is refillable for prolonged emergency use. Thanks ahead of time! Awesome DIY project! The Survival Stove Heater is not only perfect for home emergency situations and as a car heater but also when going on a survival outdoor adventure. It can be used as a source of light at the camp site at night and it can also double as tool for cooking or heating food. The best part about the DIY Survival Stove Heater is it can be assembled easily and the materials to be used are easily available and cheap. Plus, you can bring it anywhere you like because it can easily fit inside your can and survival bug-out bag. I have this stove. I added two pipe clamps one at the bottom and one at the top. I then got 6 flat angle brackets. I loosen the clamps and turn the arms out to stabilize the stove from tipping. I then either raise the brackets at the top or turn the arms outward depending upon the size of the pan. Tighten the pipe clamps and you are good to fire it up. Let it cool, reverse the angle brackets to rest flat on the sides, tops,and bottoms, and you are ready to store it away. I use a simpler system on my front porch, and safer besides. Take 2 cans, one small, one big (I use a small tin coffee can and a tomato past can my self.) Put a layer of sand in the bottom of the coffee can to level the second can and finish filling the coffee can to almost level with the small can (this depends on how big the small can is, or how high you want it), fill the smaller can with lamp oil (not a lot just a splash) and fill the second can again with sand, add grill or lighter fluid (note if you use grill fluid it is somewhat harder to light) and light. The fluid burns slow and steady. (I modified this from an old army trick) You can cook off this setup. The outer layer of sand means the sides of the can is cool. (keep in mind that this is an open flame and watch your children. making a large cut in the larger lid directs the flame and the smaller can be used to snuff out the fire. No tp needed. But if you want a “wick” I would think that twine would be a better call, Or as an alternate have one that used a half buried piece of charcoal, but this one is a bigger open flame, better for outdoor use and not in a car as some would uses this system.